As a part of the Intensive Outpatient Program (IOP) at the Rush Road Home Program, a three-week treatment program that provides veterans individualized care for trauma-based disorders and injury, each patient receives a complementary Fitbit upon enrollment. My initial findings show that though the use of the Fitbits is not formally incorporated into the therapy process, patients use the device to monitor their own physical activity and sleep disturbance (both of which are related to PTSD symptomology). However, data from the Fitbits is currently not formally incorporated into the clinical care process. The purpose of this study is to identify opportunities where PGD can be utilized to improve patient care as well as the barriers that prevent use of data by exploring the needs, interests, and requirements of patients, clinicians, and the administrative team at the Rush Road Home program. 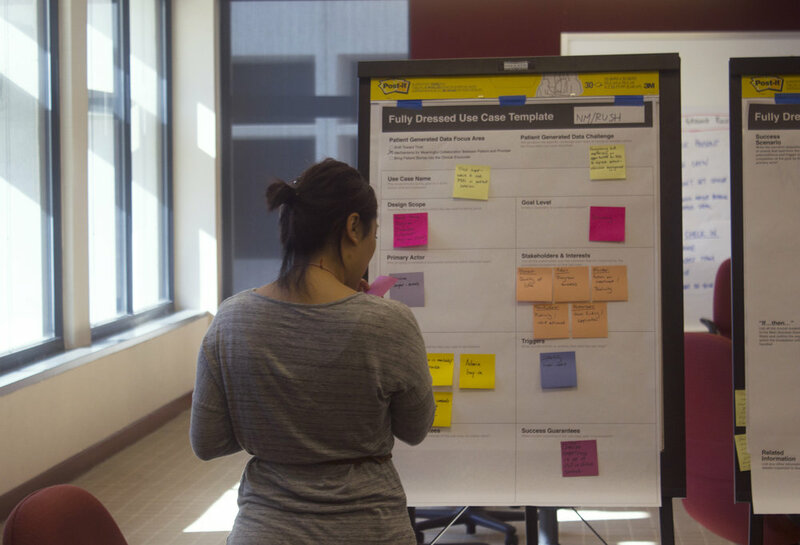 Through a workshop hosted by Reos Partners funded by the Robert Wood Johnson Foundation, our team road-mapped various use cases that would be important to explore when implementing a proposed design solution. The result was the development of a multi-phase release plan involving on-boarding a small subset of power users for feedback before deciding whether the proposed design should move forward. I drew this to use as a prop when presenting our project to RWJF program officers. One of our several scenarios explored through a use case template created by the Reos team. Writing out use cases on stickies so they can be easily repositioned. Currently, I am writing up the findings from the initial research for a conference submission in the Spring. As a Segal Design Fellow, I will continue to explore design opportunities that may involve a multi-stakeholder participatory design workshop with patients and/or clinicians. Stay tuned!